Just one look at the smart, cute, and affectionate Boston Terrier Pug mix, or Bugg, and you’ll want to take it home. But just before you do, here’s a list of what you need to know about this crossbreed. Read on and find out if you two are a perfect match. What is a Boston Terrier and Pug mix? Buggs are the epitome of cuteness. Their coats don’t require plenty of maintenance. It’s easy to keep them happy and healthy. This all sounds great! Where can I get a Boston Terrier Pug mix? Is the Boston Terrier and Pug mix the right dog for you? A Bugg or Bug dog is a designer dog that’s the cross of a Boston Terrier and a Pug. It’s not going to be tough to predict a Boston Terrier pug mix’s temperament because its parent breeds have a lot of things in common. Let’s check which adorable and the not-so-adorable characteristics Boston Terrier Pug mixes might have inherited from their parents. Like the Boston Terrier and the Pug, a Bug dog is smart, friendly, and affectionate to its human family. But this hybrid also inherited negative traits such as its tendency to be stubborn and territorial. It does not like being left alone or separated from its family. We will be talking more about these traits later in the article. 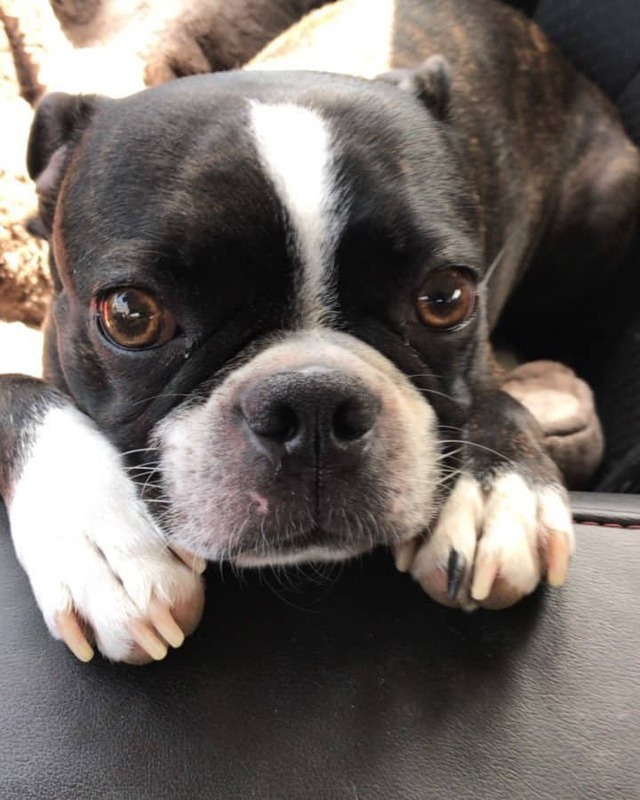 They love to be the center of their owner’s attention so don’t be surprised if the Boston Terrier Pug mix spends time on your lap to just enjoy your presence. You can also expect that they would follow you around when you’re home. There’s not a question that Buggs are loving and devoted to their owners. A full grown Boston Terrier Pug mix weighs around 15 to 25 lbs (7kg to 11 kg) and measures about 10 to 15 inches (25cm to 38cm) tall. Buggs have short, small legs, and a short tail. With their small size, it’s easy to carry them around. Like other crossbreeds, predicting how they’d look like is not easy as they can inherit features from either parent. But, good thing for this hybrid, its parent breeds have some similar facial features. Some endearing facial features the Bugg inherited from both parent breeds are their expressive round, bulging eyes and short flat muzzles. A Bug dog may inherit either of its parent’s ears. Some Boston Terrier Pug mixes have drooping ears like that of a Pug’s while others inherit the Boston Terrier’s erect ears. Common coat colors for the Boston Terrier Pug mix include shades of black, white, brindle, and fawn. Grooming a Bugg’s coat is easy because they have short and fine coats. Once-a-week brushing should suffice in keeping their coats looking healthy. Although its coat is non-hypoallergenic, the Boston Terrier Pug mix sheds moderately. This crossbreed may still be ideal for pet owners who have mild allergies. Your Bugg is energetic and loves playtime, but these dogs do not require much exercise. Taking them on a short 20-minute walk or a brisk walk around the block daily is enough to keep this pup happy and healthy. Just like any dog, Boston Terrier Pug mixes need to have their teeth brushed everyday to ensure they maintain excellent dental health. Their ears need to be checked and cleaned at least once a week to avoid infection. The Bugg’s nails also need to be clipped every three weeks. While a Boston Terrier and Pug cross may not require too much exercise, it is not comfortable being left alone for too long. Your presence in its day-to-day life is a must for this breed. With proper care and vet visits when necessary, a Boston Terrier Pug mix’s life expectancy is about 10 to 15 years. However, they are prone to some health conditions that are common in their parent breeds. Obesity – it is a known fact in the doggie world that a Pug has the tendency to overeat. The Bug dog may inherit that from its parent. It’s important to limit this crossbreed’s food intake to ¾ to 1.5 cups of dry dog food per day. Brachycephalic airway obstruction syndrome (BAOS) – This condition causes a dog with a short nose to have difficulties in breathing. You might find your Boston Terrier-Pug hybrid trying to catch its breath when they run or during any rigorous play. Snoring is also a symptom of this issue. Dermatitis – This is a skin condition that Boston Terrier-Pug crosses may inherit due to the folds on their faces and their twisted tail. You should take them to the vet if you see signs of skin irritation. A Bug dog is smart and has an eager-to-please nature, making Boston Terrier Pug puppies easy to train. Clicker training works well for them. A lot of positive praise and treats during your training sessions will be appreciated by this breed. 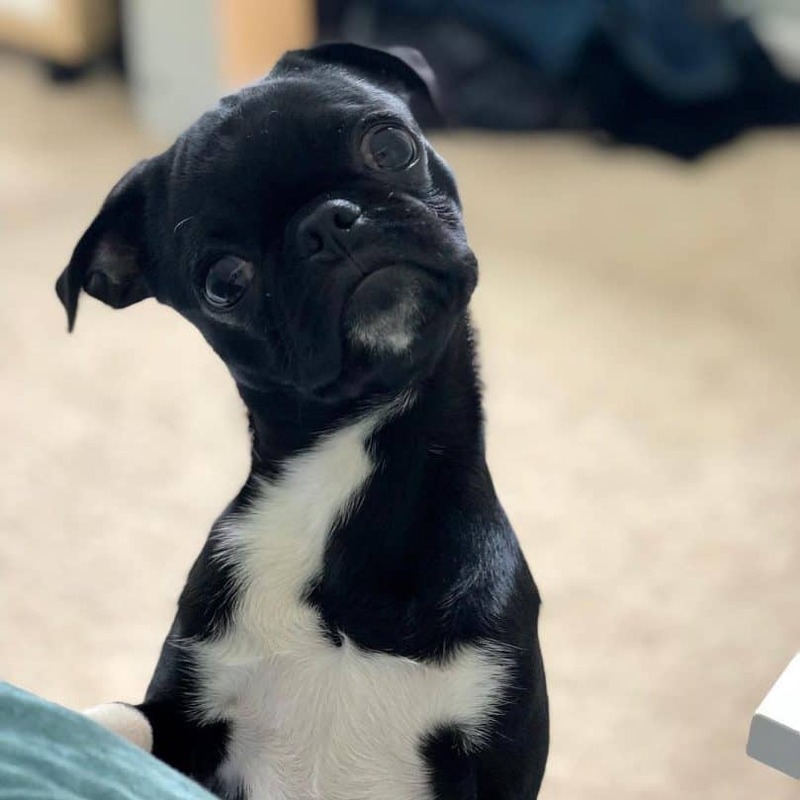 While a Boston Terrier Pug mix might inherit positive traits from its parent breeds, it can also inherit negative tendencies that can become serious behavioral issues if not addressed early on. 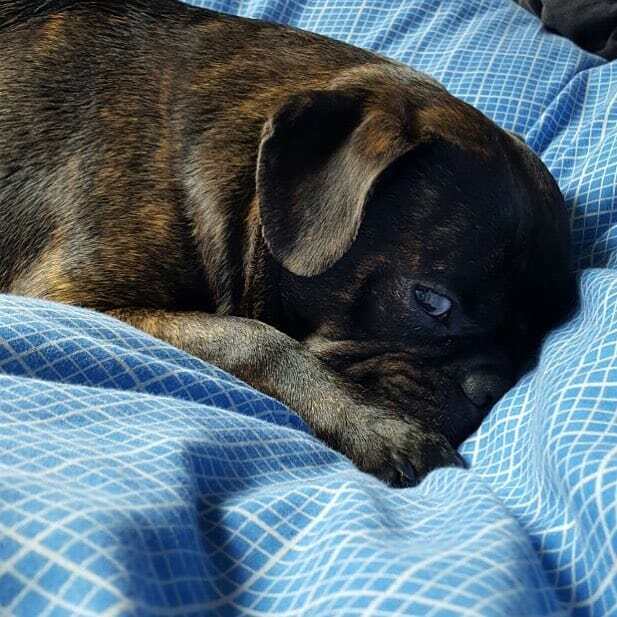 Stubbornness – Sometimes a Pug and Boston Terrier mix just chooses not to do what you say. Obedience training while the Bugg is still a puppy can help fix this. Jealousy and territorial behavior – Early socialization with humans and other pets at home is the key to keeping a Bug dog from being territorial. They don’t like being left alone – The Boston Terrier-Pug hybrid may get frustrated if left on its own for extended periods. Make sure to leave your dog with some toys and treats to distract it from your absence. A Boston Terrier Pug mix puppy costs around $575 to $1600 from a breeder. You may also opt for Bugg pups who are for adoption from shelters and rescue organizations. Overall, these Buggs are low-maintenance, smart, and loving pets, making them very irresistible. Although they may inherit a number of serious health and behavioral issues from their parents, those issues can be addressed by proper training and visits to the vet. Leave a comment if you think this hybrid dog is perfect for your family.